Can Butter Be Frozen and for How Long? A primary ingredient in baking and cooking, butter is a staple most households can't live without. Finding a good sale or stocking up for the holidays can mean taking home more than you can use before it expires. Fortunately, butter is a product that not only keeps for a long time, but can also be frozen to extend its shelf-life. Butter is a product that freezes well and keeps fresh as long as it is properly packaged for freezing. When freezing butter, wrap the sticks in plastic wrap, then tightly in aluminum foil. Place the wrapped butter in a freezer bag. For freshness, do not remove the butter from its original waxed wrapping, and be sure that the bag is a zip-top freezer bag. Regular zip-top bags are not meant to keep food fresh in the freezer. In the refrigerator, butter can be safely stored for up to one month. Consult the package for its sell-by date, but be aware that the Western Dairy Association says dairy products can stay good up to one week or longer after the sell-by date. Butter can be left out on the counter for one to two days before spoiling. In the freezer, properly stored butter can last six to nine months. Butter stored longer than one year should be discarded. When freezing butter, the optimum temperature is zero degrees Fahrenheit or below. Placing the butter too close to the back of the freezer, where the cold air flows in, can cause it to become freezer-burned. Leaving butter in its original box before wrapping it and placing it inside a freezer bag can help to keep butter fresh while in the freezer. Finally, according to "StillTasty," salted butter keeps longer than unsalted butter when frozen. The safest way to thaw butter, according to Clemson University, is overnight in the refrigerator. Butter can also be thawed on the counter overnight, but for immediate use only. 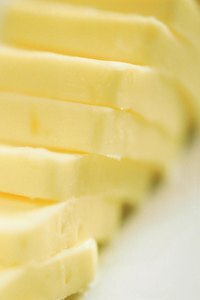 Butter left on the counter will come to room temperature, ideal for recipes that require butter to be soft. Never thaw butter in the microwave. Western Dairy Association: What does the Sell By date mean?